The Sage 100 Accounts Payable module offers comprehensive A/P management features and powerful reporting tools to help you manage your expenditures. This comprehensive solution allows you to perform basic A/P functions such as recording transactions and obligations to vendors and creditors, as well as more advanced features such as cash disbursement and check writing options. It also allows you to take advantage of the discounts associated with specified payment terms. 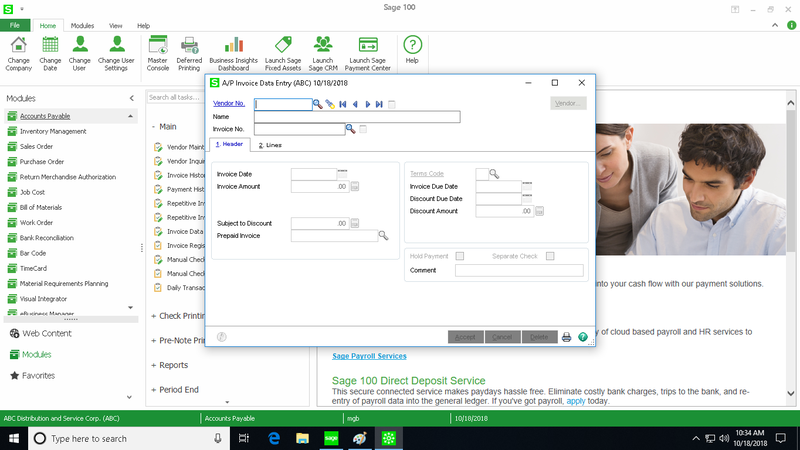 The Sage 100 Accounts Payable module features a dual-grid entry screen to help you raise productivity, as you can see your accounting by department or division. You can also use the dual-grid entry screen to access multiple bank accounts and audit changes to the vendor master file, use tax, and freight allocation. Other useful tools included within the Sage 100 Accounts Payable Module include the ability to perform automatic payment selection, access detailed invoice history, record check reversals, print checks on standard or custom stock, or add new vendors and codes as you go. The reporting features included in the Accounts Payable module included bundled reports and forms that allow you to take advantage of Crystal Reports for Sage 100. It enables you to add user-defined fields and personalized settings to any data within Accounts Payable, Accounts Receivable, and General Ledger. Best of all, it integrates with Microsoft Office to help you generate customized communications to your vendors. Reports included in the powerful, easy to use Accounts Payable module include 1099 Forms, Accounts Payable Analysis, Aged Invoice Report, AP Expense by GL Account Report, Cash Requirements Report, Check Detailed History Report, Daily Transaction Register, General Ledger Posting Recap, Invoice Hstory Report, Invoice Payment Selection Register, Monthly Purchase Report, Open Invoice by Job Report, Payment History Report, Receivable Clearing, Repetitive Invoice Listing, Sales Tax Report, Trial Balance, Vendor Mailing Labels, Vendor Masterfile Audit Report, Vendor Purchase Analysis, and Vendor Purchase History by Period. Streamlined, Personalized Grid Entry – Dual-grid entry allows you to work the way you want to in Sage 100. Organize your columns in the way that makes most sense to you or separate your more often used fields in a primary grid and your infrequently used fields in a secondary grid. Divisional Accounting – Each division or department within your organization can be assigned a separate A/P general ledger account. Accounts Payable and Accounts Receivable Clearing – Eliminate the manual matching process of writing checks by applying invoices automatically or selectively to a vendor’s balance. Payment History Report – The Sage 100 Accounts Payable module allows you to access the invoice history file for a detailed record of A/P invoices, which provides a record of payments versus invoices for each check. Use Tax and Freight Allocation – Specify which GL account to invoice for freight or apply a use tax to the entire document. Credit Card Balance Transfer – Track purchase history for alternate vendors within a credit card invoice. Automatic Payment Selection – Set up automatic bill payments based on due date, discount due date, or vendor and select full or partial payments for each bill. Invoice Entry – Automatically calculate due dates, discount due dates and amounts, and expense invoices to accounts as needed. Repetitive Invoice Processing – Set up automatic check printing and payment for recurring bills such as rent, insurance, and loan payments. Checks – Use Sage 100 to print checks on standard or custom check paper. Extended Stub Report – This report allows you to see extra information pertaining to a check payment. Manual Checks – Capable of recording handwritten checks, voided checks, and reversals, and also printing individual and batch checks. Check Reversal – Features the option to reverse the entire invoice if the check is returned. International Address Capability- Input international addresses file options that include extra address lines, country codes, international postal codes, and extended phone number fields. Memo Manager – Maintain memos in history using full editing capabilities and specify selected vendor memos to automatically pop up during data entry activities. Vendor Master File Audit – Track additions, deletions, and changes within your vendor master file. Business Alerts – This module monitors your Sage 100 data and send email notifications to specified employees, customers, or vendors based on certain events. For more information about the Sage 100 Accounts Payable module, call the certified Sage 100 consultants at Accounting Business Solutions by JCS at 800-475-1047 or email us at solutions@jcscomputer.com. We offer Sage 100 support, training, and data repair for all versions of Sage 100, including Sage 100 ERP, Sage 100cloud, and Sage 100 Manufacturing. Your success is our goal!